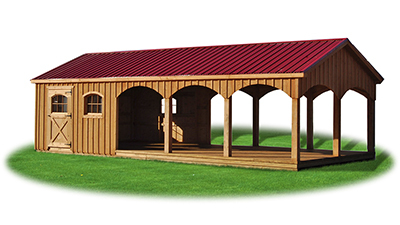 If you are searching for that unique look in that special spot in your backyard, Pine Creek Structures can help. 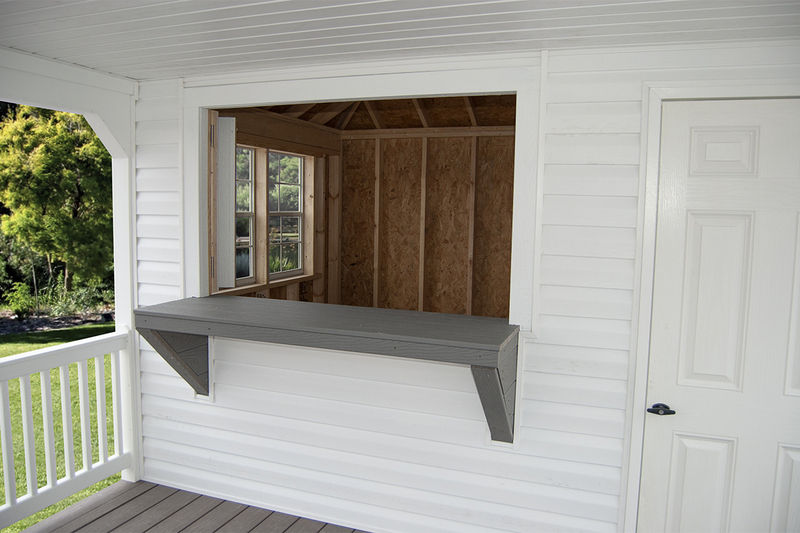 We will help you design a cabana, pavilion, poolside building... we can even install a bar window! 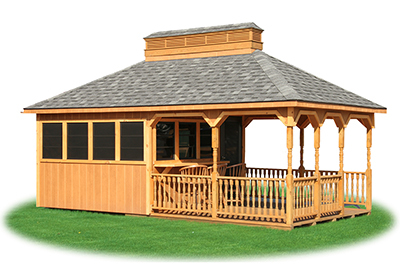 Just bring us your ideas and our trained sales team will help you custom design the perfect structure and provide you with a free quote. 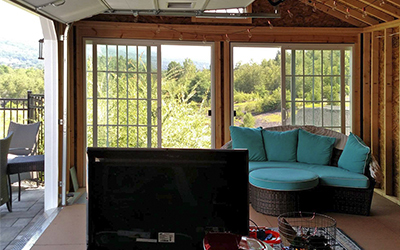 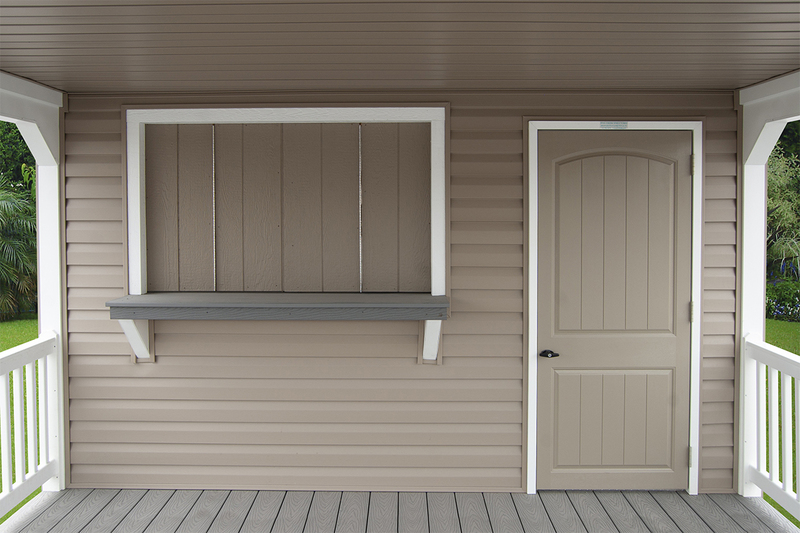 These units are available with screened in porches, bar and concession windows, complete interior finishing, electrical, and more... the only limitation is your imagination! 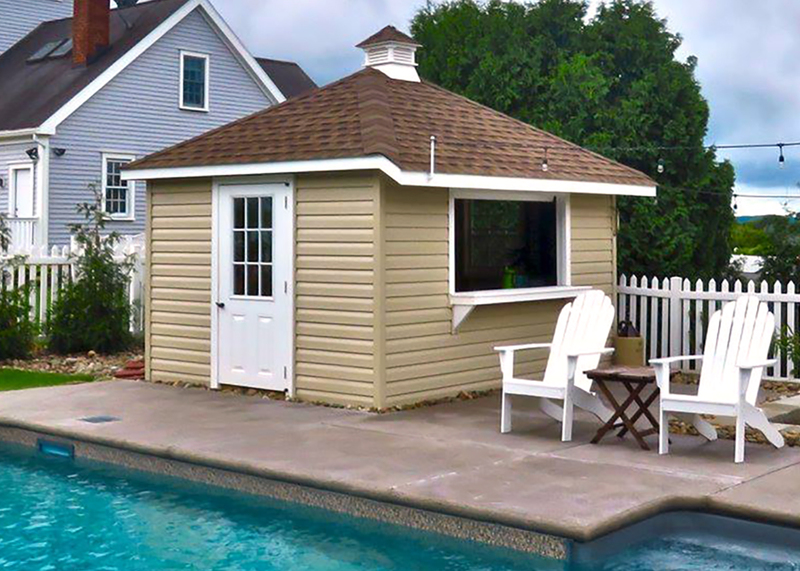 Cape cod style building shown with new linen vinyl siding, artisan clay trim, artisan clay fiberglass doors, 24" x 36" windows, and barkwood shingles. 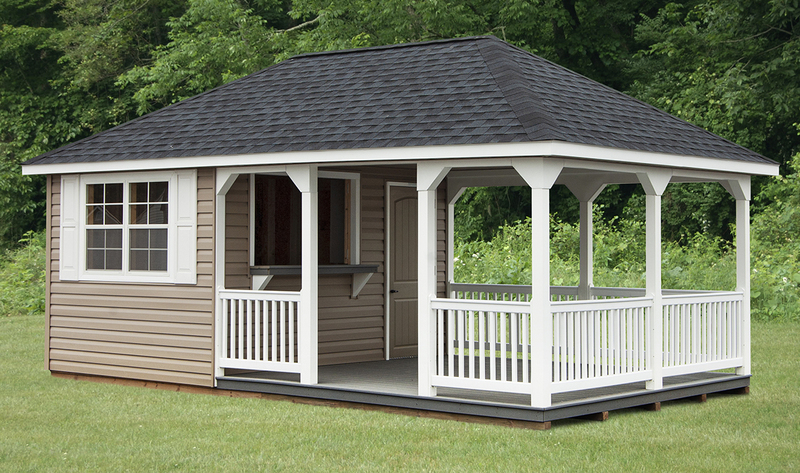 Upgrades shown on this structures: Shingle-over ridge vent, 14' porch with composite deck, and diamond tread plate. 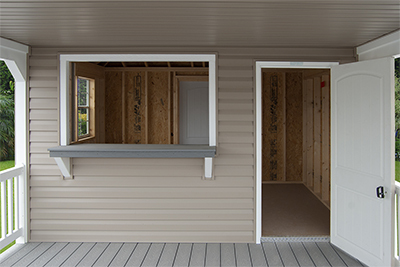 Hip style building shown with LP Smart Side siding, cedar stained trim, and fox hollow gray shingles. 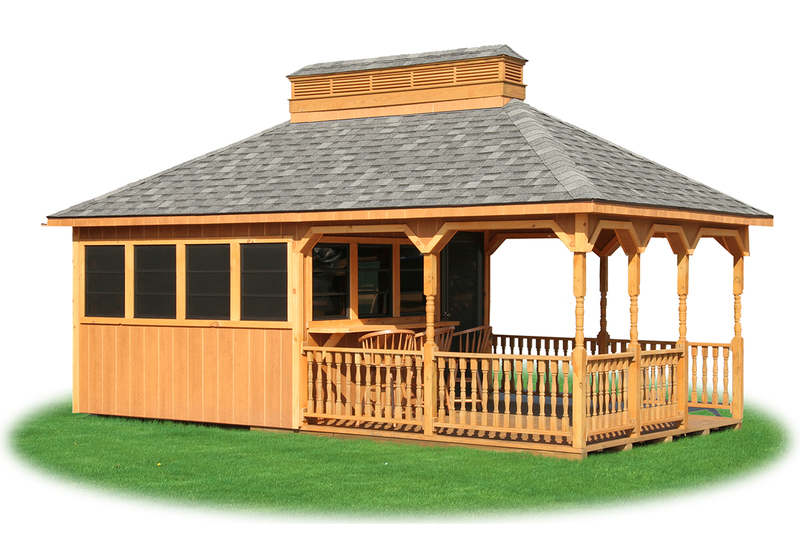 Upgrades shown on this structures: 12' porch with railing, bar area, oversized vented cupola, full glass door, and additional windows. 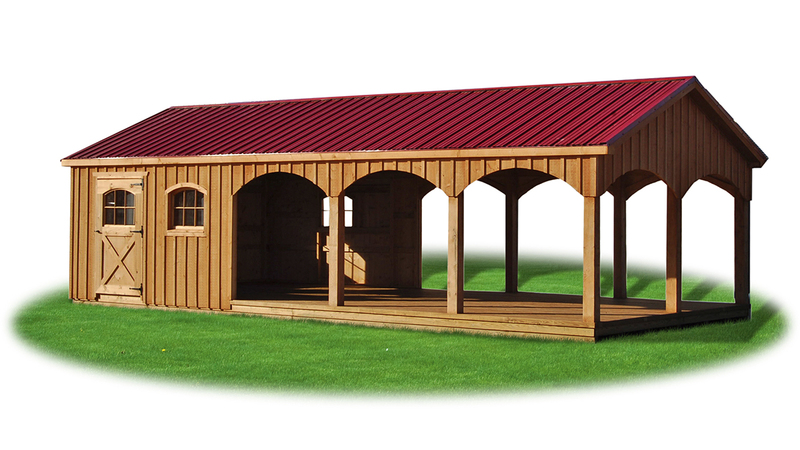 Peak style building shown with board 'n' batten siding and red metal roof. Upgrades shown on this structures: 8' Kitchen area and 24' porch area, archtop windows, carriage house style door, and upgrade to metal roof. 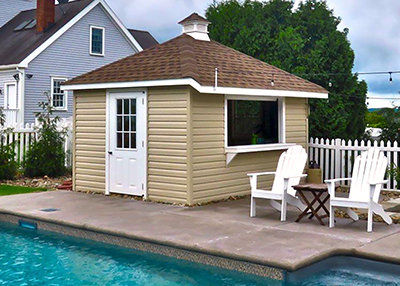 Cape cod style building shown with classic sand vinyl siding, artisan clay trim, artisan clay fiberglass doors, 24” x 36” windows with artisan clay shutters, and shakewood lifetime shingles. 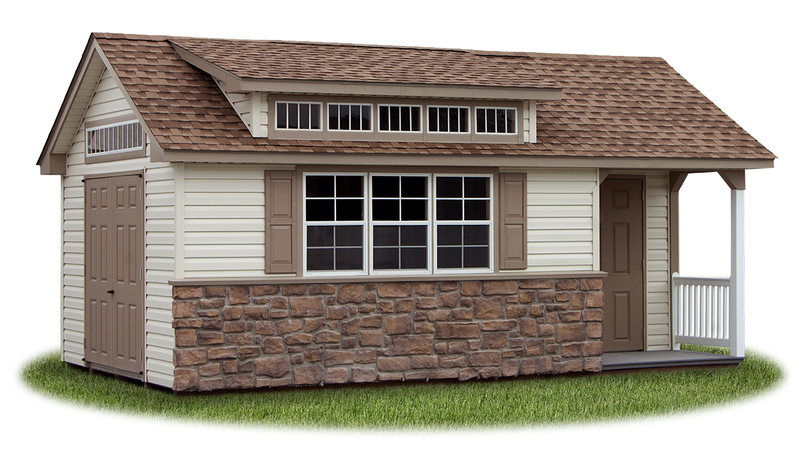 Upgrades shown on this structures: 112” cape dormer, shingle-over ridge vent, transom windows above double doors, additional window, 4’ x 6’ corner porch with composite deck, sandy ridge cobblestone stonework, and diamond tread plates. 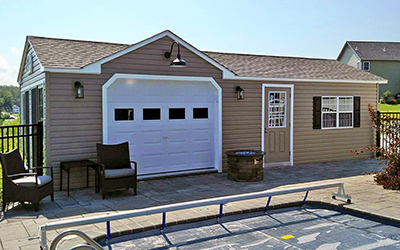 Cape Cod style building shown with new linen vinyl siding, artisan clay trim, 24" x 36" windows with red shutters, and weatherwood shingles. 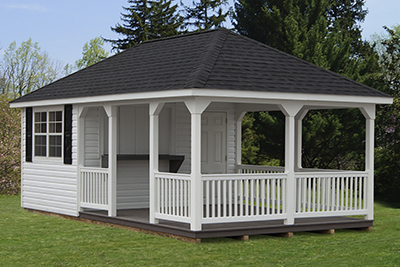 Upgrades shown on this structures: Shingle-over ridge vent, octagon window in gable, 5' porch with vinyl railing and composite deck, and upgrade to 11-lite fiberglass door. 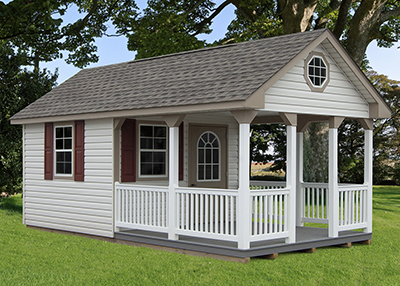 Hip style building shown with warm sandalwood vinyl siding, white trim, white shutters, and barkwood shingles. 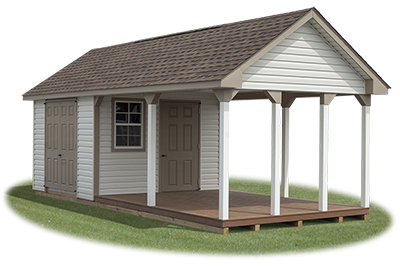 Upgrades shown on this structures: Vinyl cupola, concession window with poly wood bar, upgrade to 9-lite door, wider eave over concession window, and electrical package. 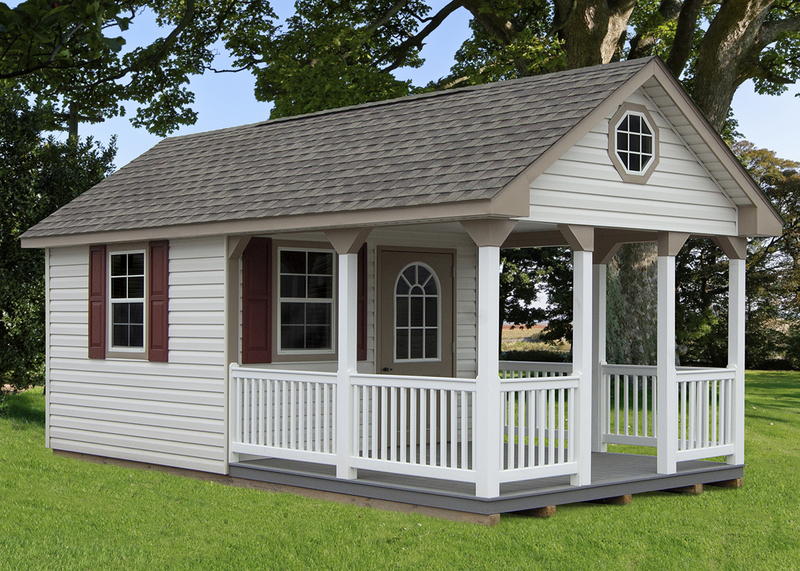 Hip style building shown with white vinyl siding, white trim, white fiberglass doors, 24" x 36" windows with black shutters, and charcoal shingles. Upgrades shown on this structures: Shingle-over ridge vent, 12' porch with vinyl railing and composite deck, 5' bi-fold window with 16" poly wood bar, and diamond tread plates. Peak garage style building shown with artisan clay vinyl siding, white trim, 24" x 36" windows and black shutters, and weatherwood shingles. Upgrades shown on this structures: Full length shingle-over ridge vent, roundtop window in gable, 12' roof dormer, window panel in garage door, additional garage door (installed on gable end not shown in photo above), sliding patio doors, upgrade to 9-lite house door, diamond tread plates, and vinyl wall plates (customer installed exterior lights after delivery). 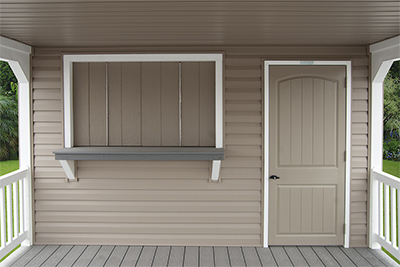 Fill up your new canana's porch with our line of outdoor patio furniture!